When being attacked in melee by an enemy infantry unit (including Combined Arms attacks), a cavalry unit may choose to Retire and Reform instead of staying and fighting in the melee. Before an infantry unit is about to melee an enemy cavalry unit, the attacking player must ask if the cavalry unit is going to Retire and Reform. 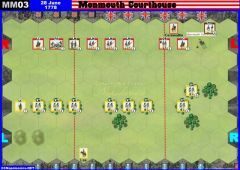 The defending player must then declare that the cavalry unit will Retire and Reform or that the cavalry unit will not Retire and Reform, before the attacking infantry unit rolls its battle dice. A cavalry unit may not Retire and Reform if it cannot retire 2 hexes towards its side of the battlefield. 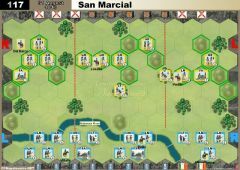 Occupied hexes, impassable terrain and the edge of the battlefield may prevent the cavalry unit from retiring 2 hexes. Passable terrain that normally halts movement does not prevent Retire and Reform. When the cavalry unit does not choose to Retire and Reform, or cannot Retire and Reform, the melee is resolved normally. Before the cavalry unit conducts Retire and Reform, the attacking infantry unit determines and rolls the proper number of melee battle dice against the cavalry unit. Artillery battle dice in a Combined Arms attack are still rolled if the cavalry unit elects to Retire and Reform. Only cavalry symbols will score a hit in any combat against a cavalry unit electing to Retire and Reform. All other symbols, including sabers and flags, are ignored. If the cavalry unit receives a hit and has an attached leader, a leader’s casualty check is made normally. After the attacking infantry unit’s dice roll, the cavalry unit’s Retire and Reform movement of 2 hexes toward its own side of the battlefield is made. The attacking infantry may Take Ground after a cavalry unit vacates the hex. A cavalry unit may not Battle Back when it elects to Retire and Reform, even if it ends in a hex that is adjacent to the infantry unit that was making the melee attack. A cavalry unit may not Retire and Reform when an infantry unit Battles Back. 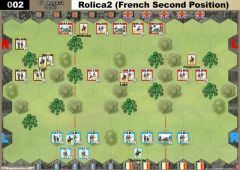 EXAMPLE: The cavalry unit is attacked and the French player announces he would like to Retire and Reform. The British player is first allowed to roll four dice (for his four blocks) hitting on only cavalry symbols. 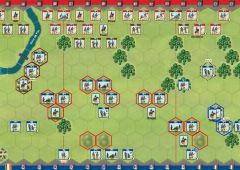 If the French cavalry unit survives the attack it must retire two hexes towards the friendly side of the board. Hexes marked A are prohibited since each hex moved must be closer to the friendly board edge. Hexes B and C are prohibited since B is occupied and C is impassable terrain. The only legal destination hex is D.
An Infantry Square is a defensive formation used by infantry units to counter an enemy cavalry melee attack. While an infantry unit is in square it may not move, but may be ordered to battle. While in square, the maximum number of battle dice an infantry unit may ever roll in ranged combat or in melee is 1 die. Nothing will increase the number of battle dice an infantry unit in square may roll. An infantry square’s battle die however, may be reduced by terrain modifiers so the infantry unit in square may not have a die to roll. An infantry unit at any strength may choose to form square during the opponent’s turn before a cavalry unit is about to melee attack the infantry unit. The attacking cavalry player must ask if the infantry unit is going to form square. 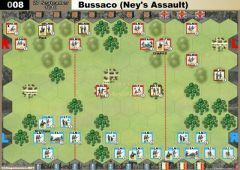 The player in control of the infantry must make the choice to form square or take on the full force of the cavalry attack. When you hold two or fewer Command cards in your hand. When the infantry unit is on certain terrain hexes, see Terrain rule section. When a cavalry unit is Battling Back. When an infantry unit is attacking a cavalry unit in melee and the cavalry unit plays a First Strike Command card. 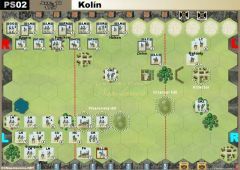 EXAMPLE: The opposing player draws one card from the player’s hand and places it on the owning player’s Infantry In Square Track. The corresponding Square marker is placed on the map adjacent to the unit. If the infantry unit does not choose to form square, the cavalry melee attack is resolved normally. 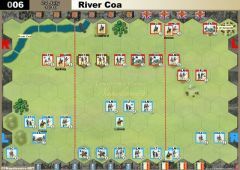 When the infantry unit chooses to form square, the attacking cavalry player selects one card at random from the defending infantry player’s hand of Command cards. The attacking player cannot look at the card selected. 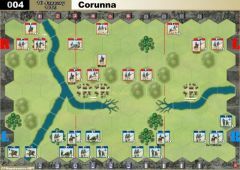 The card is placed face down on the defending player’s Infantry in Square Track and the corresponding Numbered Square counter is placed on the infantry unit’s hex to indicate the unit is in square. A player may, at any time, look at the cards on his infantry in square track, but these cards can never be moved around on the track. NOTE: An Infantry in Square counter does not count as a block that can be removed to satisfy combat losses. When a cavalry unit has forced an infantry unit to form square, the infantry unit in square will battle first with 1 die, even though the opponent is the active player (an exception to the normal melee combat sequence). The maximum number of battle dice an infantry unit may roll in melee combat is 1 die. Combat cards and troop type will not increase this number. Terrain modifiers, however, may reduce an infantry unit’s battle dice. An infantry unit therefore may not have a die to roll. Bounce Flag: When the infantry unit in square rolls a flag against a cavalry unit, it will force the cavalry unit to bounce away from the square. A bounce flag rolled against a cavalry unit by an infantry unit in square may not be ignored for any reason. A leader attached to the cavalry unit, the cavalry unit type or friendly unit support will not allow the cavalry unit to ignore a bounce flag. If the cavalry unit cannot retreat, one block is lost for each retreat hex the cavalry unit cannot complete. If the cavalry unit is not eliminated or forced to retreat from its hex, the cavalry unit may melee against the infantry square with a maximum of 1 battle die. Combat cards and unit type will not increase the number of battle dice the cavalry unit may roll against the square. Terrain modifiers, however, may reduce acavalry unit’s battle dice. A cavalry unit therefore may not have a die to roll. 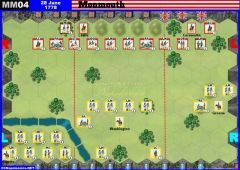 A Combined Arms melee attack may add to the total number of dice rolled by adding in the battle dice of one or more ordered artillery units (See Combined Arms Combat). 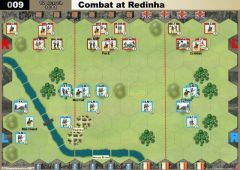 A First Strike Command card may be played by a cavalry unit that is being attacked in melee by an enemy infantry unit in square. The cavalry unit would roll 1 die against the infantry square. 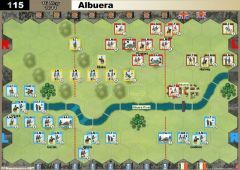 Infantry Squares vs. Infantry & Artillery Units: An infantry or artillery unit may engage an enemy infantry unit in square with ranged combat normally. An infantry or artillery unit will also melee normally against and enemy infantry unit in square, battling first against an enemy square. If the square is not eliminated in melee, the square may then Battle Back in melee with 1 die. 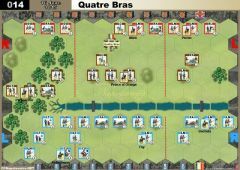 Infantry Squares and Retreats: An infantry unit in square, because it cannot move, will lose one block for each retreat hex the unit cannot complete. 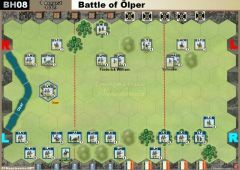 If the infantry unit’s retreat movement is more than one hex for a flag, the unit will take multiple losses for each flag rolled against it. An infantry unit in square may ignore one or more flags when a leader is attached or the unit’s troop type allows it to ignore a flag. Support: A square may act as one adjacent support unit for units not in square, however a unit in square may not receive support from friendly units/leaders in adjacent hexes. Infantry Squares and Attached Leaders: A leader attached to an infantry unit in square cannot be issued an order to detach. When the unit is ordered to come out of square, the leader may also be ordered to detach on the same turn using an additional command. 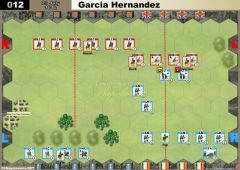 Infantry Squares Attacking: An infantry unit in square can be given an order to battle. An infantry unit in square may engage in ranged combat when there are no enemy units in an adjacent hex. The maximum number of battle dice an infantry unit in square may roll in ranged combat is 1 die. An infantry square may also be ordered to melee combat. The maximum number of battle dice an infantry unit in square may roll in melee combat is 1 die. A unit in square cannot Take Ground after a successful melee combat. 1. 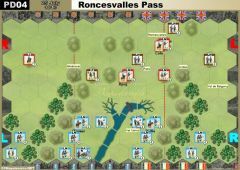 A French cavalry unit is ordered to attack a British infantry unit and the British infantry unit chooses to form square. 2. A Command card is selected at random from the British player’s hand of cards. 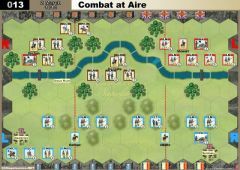 The card selected is placed on the British Infantry in Square Track and the corresponding Numbered Square counter is placed on the British infantry’s hex. 3. 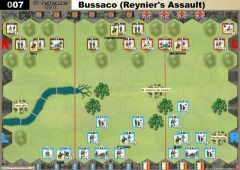 The British infantry in square battles first with 1 die against the French cavalry unit. If the British infantry rolls a flag (referred to as a bounce flag) the French cavalry unit must retreat. 4. 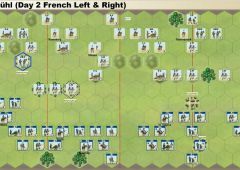 If the French cavalry was not eliminated or forced to retreat, the French cavalry unit will attack with 1 die against the British infantry unit in square. 1. The British player orders his infantry unit in square to attack the French cavalry unit. 2. The French cavalry unit may choose to Retire and Reform. With only one die to be rolled by the square, the cavalry unit chooses to stay and melee. 3. The British infantry in square battles with 1 die against the French cavalry unit. If the British infantry rolls a flag the French cavalry unit must retreat. 4. 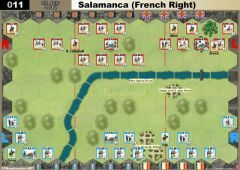 If the French cavalry was not eliminated or forced to retreat, the French cavalry unit will battle back with 1 die against the British infantry unit in square. 1. A French infantry unit is ordered to move up and attack the British infantry unit in square. The French cavalry unit is also ordered to attack the British infantry unit in square. 2. 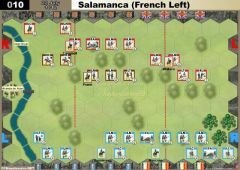 The French infantry unit battles in melee against the British unit in square with its normal number of melee battle dice. 3. 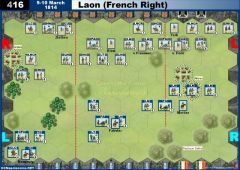 If the British infantry unit in square is not eliminated it may battle back in melee with 1 die against the French infantry unit. 4. The French Cavalry unit announces it is going to melee against the square. 5. The British infantry in square battles first with 1 die against the French cavalry unit. If the British infantry rolls a flag the French cavalry unit must retreat. 6. 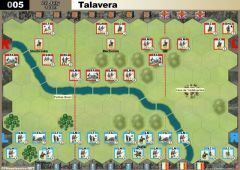 If the French cavalry was not eliminated or forced to retreat, the French cavalry unit will attack with 1 die against the British infantry unit in square. An infantry unit in square may not be ordered out of square when there is an enemy cavalry unit on any adjacent hex. The cavalry unit prevents the infantry unit from coming out of square. If there are no enemy cavalry units on an adjacent hex, an infantry unit in square may be given an order and come out of square. 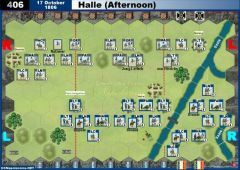 The numbered Infantry in Square Counter is removed from the hex and returned to the Infantry in Square Track and the Command card is taken from infantry in square track and returned to the player’s hand. The infantry unit may move and/or battle normally. An infantry unit coming out of square that does not move may conduct ranged combat without any movement battle dice reduction. Coming out of square is considered changing formation and not movement. 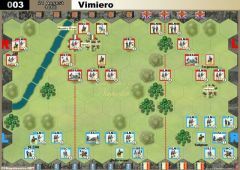 When an infantry unit’s last block is eliminated and removed, the numbered Infantry in Square counter is removed from the hex and returned to the Infantry in Square Track and the Command card is taken from the track and returned to the player’s hand. 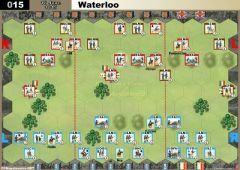 When an ordered infantry or cavalry unit is about to attack an enemy unit in melee, one or more ordered artillery units may combine their battle dice with the attacking unit. A combined arms combat must be declared before any battle dice are rolled. All ordered artillery units in the combined arms combat must be in range and have a clear line of sight to enemy unit that is being attacked. An Artillery unit on a hill may not combine arms if it has to fire over the heads of a friendly unit on a lower adjacent hex. The artillery unit must have an unobstructed line of sight path to the targeted enemy. No units or terrain may occupy the line of sight path in a declared combined arms combat. EXAMPLE: The Artillery unit on the hill can provide Combined Arms fire to the melee attack at A because its Line of Sight is not blocked by any units or terrain. It may NOT provide Combined Arms fire at B because it cannot fire over the friendly unit meleeing the target unit B. The infantry or cavalry unit determines the number of battle dice it will roll in the melee combat including any terrain reductions. The artillery unit determines the number of battle dice it will roll including any terrain reductions. The artillery’s battle dice are added to the battle dice of the friendly unit making the melee attack. All the dice are rolled together at the same time. There may be an occasion where the infantry or cavalry unit battle dice is zero. The artillery unit engaging in combined arms may still roll its battle dice. When an artillery unit engages in combined arms with a unit that does not hit on sabers in melee, the artillery dice added to the melee roll will also not hit on sabers. When an artillery unit and the attacking unit are both adjacent to the enemy unit being attacked with combined arms, if the enemy unit Battles Back it must fight against the infantry or cavalry unit, not against the artillery. Any artillery that declares a combined arms attack with a cavalry unit that is fighting an enemy infantry unit in square can lose its combined arms attack. This will happen if the infantry unit in square, when fighting first, either eliminates or causes the cavalry unit to bounce retreat. The artillery unit’s combined arms battle dice are lost, because the cavalry attack is repulsed before the cavalry unit could make the melee attack. 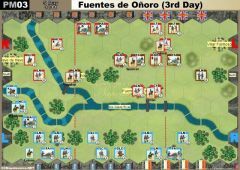 If a defending unit plays a First Strike card against a combined arms attack and either eliminates the attacking infantry or cavalry unit or forces it to retreat, the artillery’s attack dice committed to the combined arms combat are lost because no attacker melee occurs. EXAMPLE: A French cavalry unit is attacking an infantry unit in square, with combined arms from an artillery unit. The British Line Infantry unit in square rolls first and rolls a flag (Bounce Back). The cavalry unit is forced to retreat and the combined arms attack is lost. 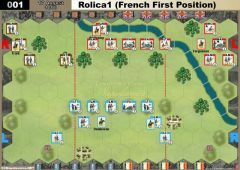 Had the British player not rolled a flag, the French player would roll one die for his cavalry unit and one die for his Horse Artillery unit (3 blocks firing at a range of three hexes). Can an artillery in contact with an enemy unit support a combined arms attack against ANOTHER enemy unit AT RANGE?